Summary of activities from 2016-18 and other important matters. 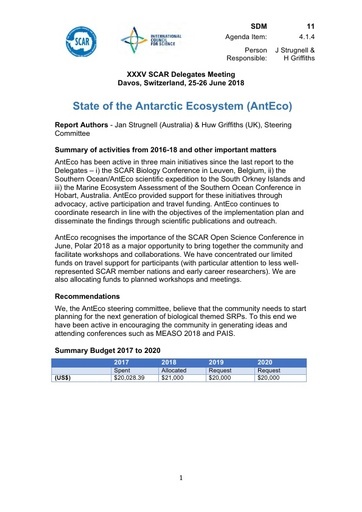 AntEco has been active in three main initiatives since the last report to the Delegates – i) the SCAR Biology Conference in Leuven, Belgium, ii) the Southern Ocean/AntEco scientific expedition to the South Orkney Islands and iii) the Marine Ecosystem Assessment of the Southern Ocean Conference in Hobart, Australia. AntEco provided support for these initiatives through advocacy, active participation and travel funding. AntEco continues to coordinate research in line with the objectives of the implementation plan and disseminate the findings through scientific publications and outreach. AntEco recognises the importance of the SCAR Open Science Conference in June, Polar 2018 as a major opportunity to bring together the community and facilitate workshops and collaborations. We have concentrated our limited funds on travel support for participants (with particular attention to less well-represented SCAR member nationsand early career researchers). We are also allocating funds to planned workshops and meetings. We, the AntEco steering committee, believe that the community needs to start planning for the next generation of biological themed SRPs. To this end we have been active in encouraging the community in generating ideas and attending conferences such as MEASO 2018 and PAIS.